Not long ago, we filmed an episode for Growing a Greener World, which was all about composting. To this day, we get many requests for the instructions on how to build the three-bin composting system made from used shipping pallets that I constructed during the episode. The beauty in the design was its simplicity, low cost, and the ability to repurpose some of those ubiquitous pallets that pile up everywhere. With a drill and a few all-weather screws, anyone can assemble a multiple-bin pallet composting system quickly and cheaply. In my case, with the help of a neighbor simply tohold the pallets in place as I drilled the screws, we had a basic three-bin composting system securely in place in a matter of minutes, literally. The bin was so functional yet simple, I started thinking of ways to enhance it. By the next day, I added a hinged roof to the section of the bin that would store the finished compost, and more hinges to that outer pallet wall of the finished compost section to allow for easier access. Pallet Selection. Pallets are made from all different types of wood. 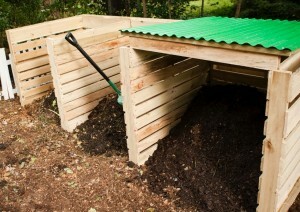 For a compost bin, it’s preferable to find those that are rot resistant, such as oak or cedar. Pine although easy to find, does not stand up to the elements as long. For strength and durability, you can’t beat hardwood. Also be aware that pallets from one manufacturer to another are not always uniform in size. For this system, it’s preferable that they’re all the same size. It makes for a better looking finished product and helps during assembly to have one uniform size. Assembly. Start with a level surface for the area where your system will set and assemble it in place. For my setup, you will need seven pallets: one for each outer wall, two for the dividers to separate the bins, and three across the back. Assembly is straightforward and intuitive. I simply started by attaching the left outer wall pallet to the back pallet with several screws. Then I added one of the inner pallet dividers and secured it against the back pallet. With the remaining pallets, work your way across for the next two sections in this same manner. In no time, you are finished with the basic setup and ready to compost. Two larger hinges were also used to attach the outside pallet wall of the finished compost section to the back pallet. My thinking was it would be a nice way to swing open that side so I had better access for retrieving compost. In hindsight, it’s a nice feature but it’s not necessary and more trouble than it’s worth. I’m building a new pallet composting bin this weekend at the Garden Farm where I now live. It will be a no-frills, basic model which is frankly the best overall and easiest by far to make. Two final thoughts: Consider grabbing an extra pallet to use just for additional parts. I removed the slats from it to place in between other slats of my finished bins wherever I wanted to close some of the gaps. It’s a smart and simple fix to help keep more of your precious compost in place. I also strongly suggest adding a long treated 2×4 across the backside of the pallet wall. The extra stability it provides is a simple and inexpensive option to reinforce the entire system. I would go with the 3″ decking screws Sharon. You want it extra sturdy so no reason not to give it the extra length to secure the joints. Will this work for horse manure? Yes, but you need a really large bin to handle all the horse manure you’re likely to get. Also, make sure your manure is free of persistent herbicides from any hay. And mix with other debris to balance out the manure if you’re making a good blended compost. But the bin itself is a good holding area for collecting the manure as it breaks down. (personally at my farm, we just let the horse manure cook down in a pile and use the pallet bins for the other inputs from the garden and kitchen and add chicken manure to the bins as well). Hi Joe, I work in a restaurant and bring home a five gallon bucket of “greens” every day. I’ve read ratios from 1:1 all the way up to 25:1 for “browns” to “greens” and I wondered if you had any suggestions for “supercarbons” to balance the high nitrogen content stuff I bring home every day. It’s not so bad in the Autumn with all the leaves but the rest of the year I fall way behind. I’ve been shredding paper from work (the only reason I keep that job is for the composting materials) but I’d love to hear about something else I could use to keep from getting too nitrogen rich. Hey Mark. Lucky you! I would tell you to don’t overthink this. Add all the nitrogen based material you can get. There’s no shortage of carbon poducts, especially from shredded paper and woody material and leaves. So continue to do what you are doing, mix it up as often as you can, try and keep it moist, and nature will take care of the rest. Part of the challenge many people have is in getting confused with the various ratio suggestions out there. I don’t subscribe to that so much. I mix all the green and browns I can get my hands on and I’ve had great success that way. Hi Joe, luv the show! My question is the 3 bin method. If I remember right from the show you suggested to move the material from bin to bin during the different stages. I guess I don’t und r stand why all that extra work? I like the full square bin style where you put the.material in the top and harvest out the bottom thru slide panels. Trying think of a skid design that would incorporate that simplicity without all the moving of composting material. Thanks for your time and keep spreading the word! Agreed Becks. I think my attraction to moving the ingredients from one bin to the next was the forced opportunity to really get into each bin and turn it over. I’ve had beautiful finished looking compost in bins, that until I really got in there, realized it still wasn’t finished. By transferring it, I really mixed things up with all the extra oxygen and moisture that I added at the same time. Having said that, I am doing a lot more composting in place. I’ve even built a four-bin pallet system for my new garden in Atlanta. This way, I focus on one bin at a time. Fill it, turn it when I can, but move on to the next bin, fill it, etc. By the time I fill my 4th bin, my first bin should either be ready to use, or well on it’s way, with minimal inputs from me. Yet, I’ll still turn and water occasionally to speed things up. I’m always in a hurry!